Today we are going to celebrate Graham Walker's 50th birthday even though it is next week. We are going to meet at a downtown restaurant. He is going to be lured by his wife Cathy to a dinner for two. Recently Graham Walker (above as a baby, is a Scottish born graphic designer who has a fondness for polished shoes) sent me an email: "I have recently bought my first Bruckner recording, Symphony no. 9 unfinished. It has some interesting rehearsal tracks with the conductor talking about the work and it's reconsctructed fourth movement. I was wondering if we should have a listen to it together in honour of Juan Castelao. I know he is a big Bruckner fan." Graham and I attend many concerts together, but principally of the baroque variety. Our friendship with Pamplona born conductor of the Vancouver Philharmonic Orchestra has widened our horizons a bit! Alas, Juan is back to working on his thesis in Oviedo. But that did not prevent Juan from expressing his opinion and suggesting (and I translate from his Spanish): "I am very sorry that I will not be there to listen to Bruckner's 9th which is one of my favourite symphonies in spite of the sadness of the 3d movement. As a matter of fact you should know that Bruckner left written instruction that his Te Deum should be played as the 4th movement of this symphony. So tell him to buy it." I know what I wil have to buy for Graham as a birthday present. And soon Graham and I will sit in my living room. In memory of Juan we shall listen to Bruckner. Some of us are awfully lucky. Roses are like cats and babies, they don't perform on demand. 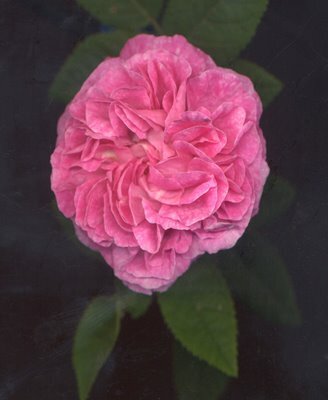 I had the intention of posting two of my "spotted" Gallica roses. I attempted to scan Rosa 'Alain Blanchard' and Rosa 'Soleil Brillant' together last night but Alain Blanchard (above, left) decided to close his petals and did not cooperate. So I left Alain Blanchard (Vibert, 1839) for this morning. Even that was difficult as Alain's colour did not scan as I saw the rose and I had to monkey with the colour balance. The lighter shocking pink spots are almost fluorescent. So here you see both roses alone, even though they grow very close to each other in the garden. Soleil Brilliant's spots are less noticeable and perhaps the reason is that it is a young bush in its first season in my garden. Langley rose grower Christine Allen handed Soleil Brillant to me in this year's VanDusen plant sale. "Alex,you like odd roses. This is an odd rose." I found Alain Blanchard (not the kind of rose you can normally find in nurseries) at the Burnaby Garden Works. Many people believe that my spotted roses are like that because of Vancouver rain but that is not true. I find them fascinating and even more so when Rebecca pronounces their names in her perfect French. 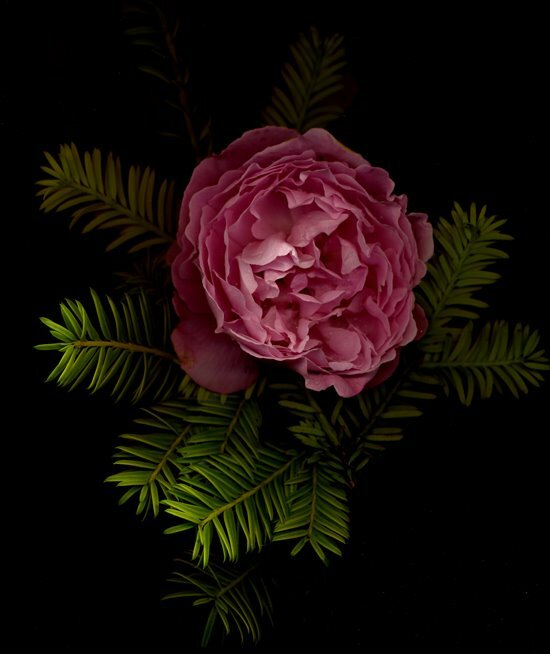 Because they are Gallicas they have an intense perfume but only bloom once. More than any other plant in my garden these Gallicas (even the unspoted ones) give you a reason to want to stay alive through the winter to see what they will do next spring. Sports photography has never been one of my strong suits. Luckily I was never asked by any magazine to shoot indoor basketball. I believe it must be extremely difficult. Magazines have assigned me in the past to shoot female rugby games, golf and hockey many times. It was the great American sports photographer Neil Leifer who best explained the problem. He pointed out that he had access to any kind of equipment including some special Canon cameras with motor drives that shot at 15 frames per second. Leifer said, "I noticed that the best picture was always between frames." Leifer understood that you have to be familiar with the game, its peak action and know instinctively the shutter lag of your camera. This is the period of time between the pressing of the shutter button and the exposing of film or sensor. The photo I include here came about because of advice from my friend Michael Varga who has been a sports cameraman for the CBC for at least 34 years. He is the best there is. 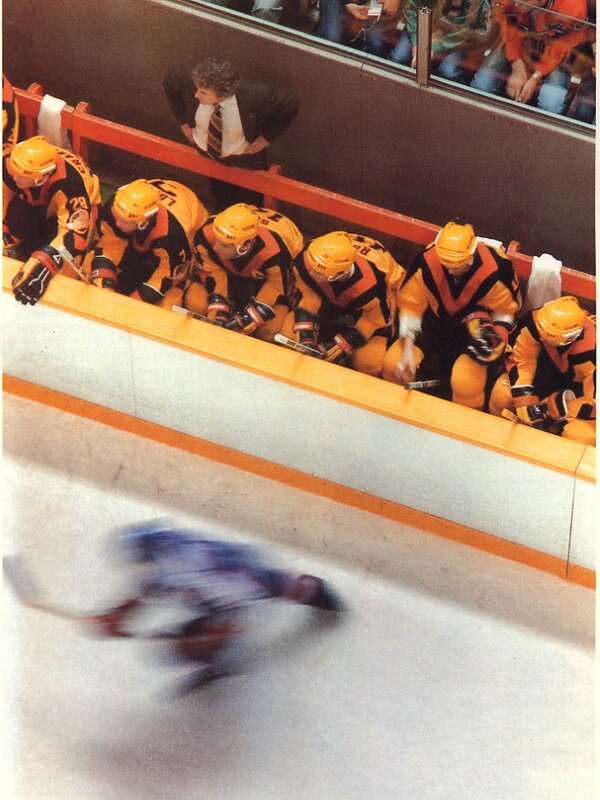 When I ran into him at a hockey game at the Canuck's Coliseum (this one taken in 1983 has Roger Neilson at top left)I asked him where photographers never went. He looked up into the rafters. On the second day of our open garden, this Sunday we were visited by Peter Lekkas and his shiny red Citröen Deux Chevaux. I quickly forgot showing Peter (a card carrying member of the Vancouver Rose Society) my red Gallicas and demanded that he take Rebecca and me for a ride in his wonderful 1978 Citroën. This was the first time I had ever been in one. In the early 60s in Buenos Aires, I often ate with my friends at the German restaurant, the Bodensee in Belgrano where besides eating multiple servings of apple pancakes we often drank too much. 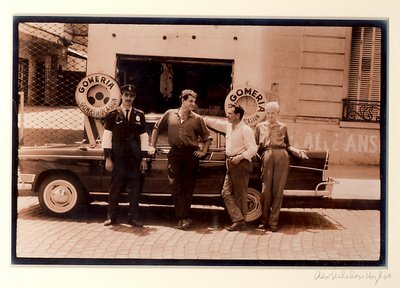 On our slow meandering walk home we would pick up every Fiat 600 and Citroën 2CV in sight and place it on the sidewalk behind a city tree. 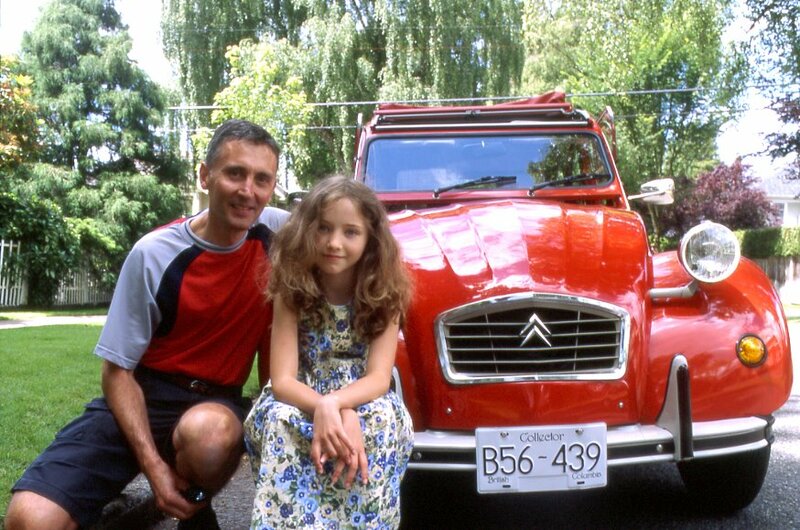 With Rebecca in the back seat, being inside the Citroën was much more fun than lifting one. Part of the pleasure of riding with Belgian Peter Lekkas is that he has an infectuous positive attitude towards life that is always reflected in his easy smile. He proudly told me that his 6 Club 2CV with a 602 CC, 28 horsepower engine goes 50 miles to the gallon. The 6 Club is a luxury version since it comes with a radio. 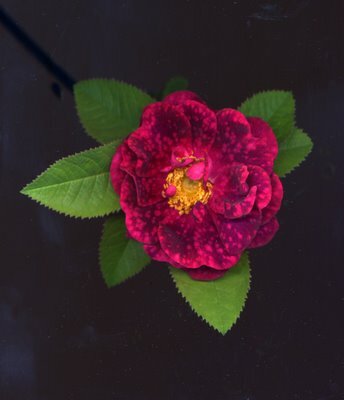 Until recently I had never connected the man who wears a pith helmet at the VanDusen plant sale ( in the booth with the Red Patio Wonders and other mini roses) with the compassionate veterinarian at the SPCA. A pity that he is treating cats and dogs. We would be less depressed and much better persons if he treated us. My first ever one person show about 12 years ago came about when a show fell through at the Exposure Gallery on Beatty Street in Vancouver. The curator, Brian Lynch, called me up is desperation and asked me if I could put a show together in a week and a half. I contacted model Lisa Montonen and asked her to show up at my studio. Ken Knechtel, of Rainforest Garden, provided me with a variety of hosta leaves. In two hours I photographed Lisa with one light and in some way holding a hosta leaf. She wore nothing and the name of the hosta would suggest the pose. Here she is holding Hosta 'Hyacinthina'. This hosta is really the mother of most variegated hostas as it tends to sport and mutate with frequency. From Hyacinthina we have such excellent hostas as Gold Standard, Captain Kirk and Strip Tease. And some poetic ones, too, like Hosta 'Robert Frost'. I had met Lisa at a beauty competition where clearly she was the most beautiful woman there. She had not won. She had been in tears and I had explained that in beauty competitions real beauty was a disadvantage. My father George taught me many things. Perhaps the most useful was how too cook since Rosemary cooked little when we married and gradually did even less. My father said, "To cook you must be able to make a sauce." That was the most practical cooking advice I ever received. I remember as a little boy being in bed with my father and both of us would sing, "Daisy, Daisy......." He read Leslie Charteris's The Saint books. He told me that Leslie was a man, in spite of his name and that the definition of such a name was epicene. This is perhaps why I called my second daughter Hilary. My father died when I was in the Argentine Navy in 1964. I took this picture on Carabobo Street in Buenos Aires two weeks before he died. These were some of his friends. The car is an Argentine built Siam Di Tella, otherwise known as an Austin A-60.